When news broke that Godspeed You! 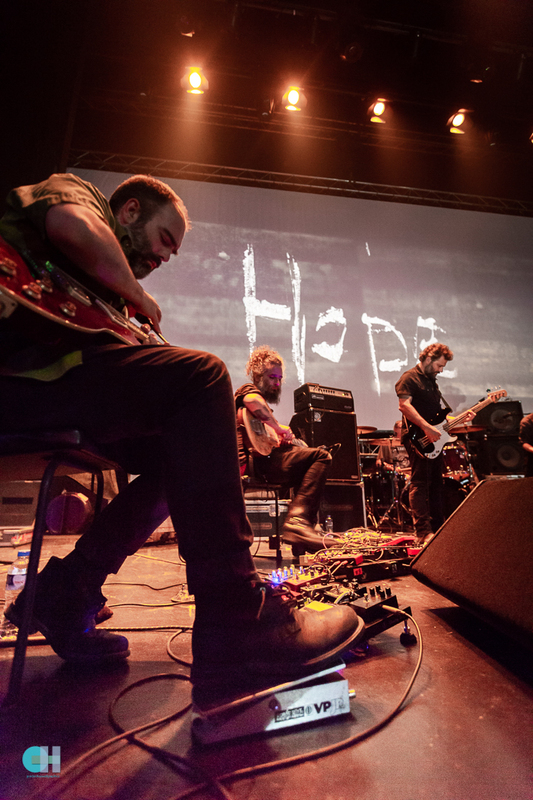 Black Emperor were lumbering into Greece for the first time in 8 years, expectations were understandably high. Such was the demand, that the venue was soon changed and it was for this reason that the Gazi Music Club saw a capacity crowd descend upon it for the arrival of the enigmatic Canadians. Arriving on cue at 10 they, as ever, began with the rising Hope Drone. 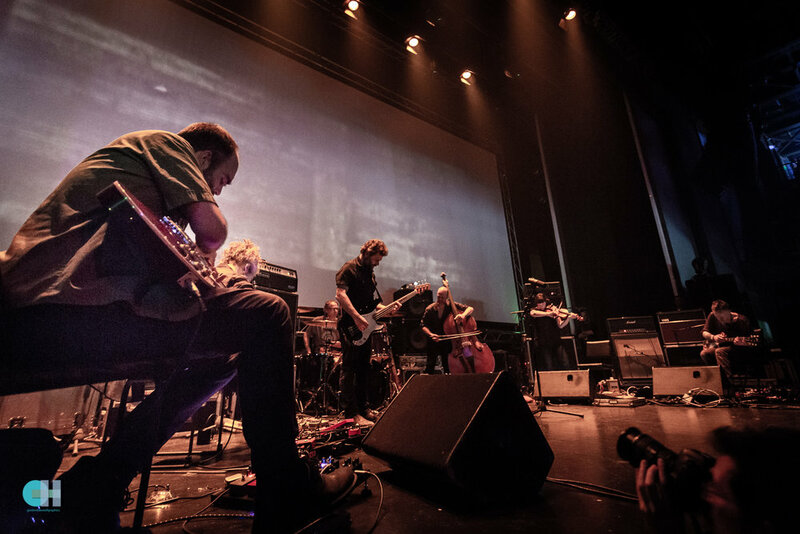 A piece of noise that swells and groans and creaks while various members amble onto the stage in their own time and seemingly, lazily, lock in with each other. Behind them the word hope is scrawled across a backdrop of TV static. It doesn't look very convincing and nobody is fooled into believing we will be leaving the arena tonight with a newly found sense of hope in the current world. Mladic follows and it soon becomes clear that GY!BE are nothing to look at, a number of band members spend the entire gig sitting down and the lack of lights and special effects soon becomes very apparent. They may be put under the same umbrella as bands like Sigur Ros and Radiohead but as a visual show, they are miles apart. 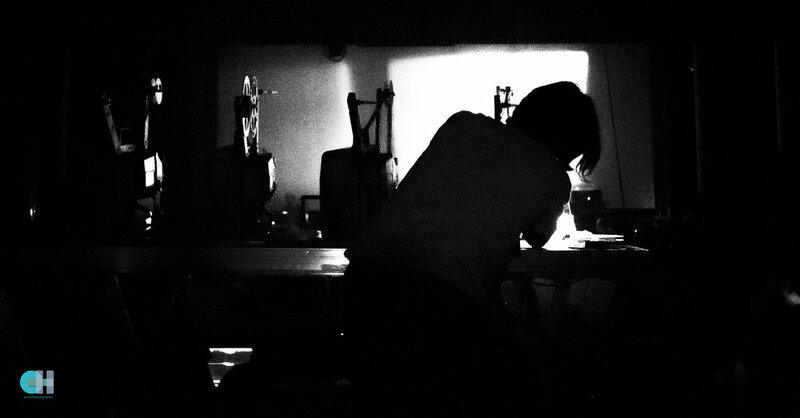 This however, is not necessarily a bad thing as the static demeanor on stage allows the audience to focus on the real star of the show, the projectionist who spends his evening juggling 4 old school film projectors like a turntable. Reams of tape hung up beside him, he constantly changes and cuts and threads the film as the screen portrays various forms and loops of historical events as an incredible black and white backdrop to the music. That's right kids, there is no midi synch here. It is really quite a powerful statement, Not least during a stunning rendition of ‘Undoing a Luciferian Towers’ when the band were joined by Danish Saxophonist Liberty, who, upon turning her back on the audience in order to see the screen, delivered a quite beautiful noise while allowing the image of a looping falling plane to dictate to her. As the chaos unfolded behind them the band unassumedly created the breathtaking soundtrack to the evening. Efrim Menuck and Mike Moya spent the night hunched over their guitars, a bare footed David Bryant seemed more interested in his pedals than his guitar and Sophie Trudeau seemed to be alone in the room with her violin. This didn’t seem to be about the audience, you got the impression that they were incindental. Had the band had a day off they probably would have spent it doing the exact same thing, such was the release it seemed to bring, The music droned, soared, crashed and roared, no words, no thank yous, nothing to disrupt the flow and the atmosphere. (Steven Wilson take note). Breathtaking in its simplicity, the melodies were picked out among the dirt and thrown out into the air to land where they may. By the time Moya had brought the evening to a quite literal fiery close, 8 songs and 2 and a quater hours had passed. Never before had so much been said with so little. K/G/D, a noise musician had opened proceedings with a 30 minute set of droning, pulsing noise coming from various synths and pedals. Its a repetitive, yet hypnotic start to the evening and rightfully received quite warmly by the amassed audience and proving once again that it is always worth the time and effort to turn up early. A perfect appetiser to what was to come. Greek Band Akoloupotoi playing at Galaktiko Xorio's Let it Beer festival in Chalkis, Greece.